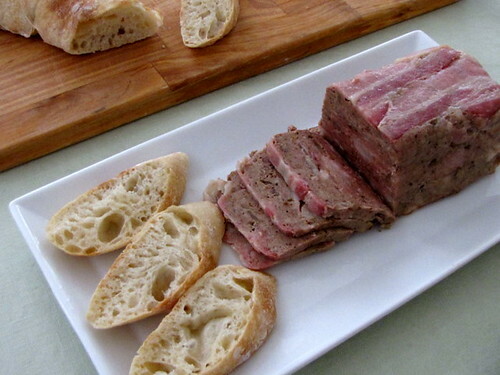 Daring Cooks: Pâté and Bread ~ I Can Do That! Our hostesses this month, Evelyne of Cheap Ethnic Eatz, and Valerie of The Chocolate Bunny, chose delicious pate with freshly baked bread as their June Daring Cook’s challenge! They’ve provided us with 4 different pate recipes to choose from and are allowing us to go wild with our homemade bread choice. I chose the Chicken Liver Terrine and used all the ingredients in the recipe. It is super delicious and the perfect topping for Peter Reinhart's Pain à l'Ancienne mini baguettes. It's a surprise that I really love it because I hardly cook any kind of liver except for one Filipino dish. I couldn't stop eating it as soon as it has cooled overnight in the refrigerator. Melt the fat or butter in a skillet over low heat. Add the onions and cook, stirring occasionally, for 5 minutes, until softened. Add the chicken livers and cook, stirring frequently, for about 5 minutes, until browned but still slightly pink on the inside. Put the minced pork belly and shoulder in a food processor, then add the onion-liver mixture and the chopped shallots and pulse until you obtain a homogeneous mixture – make sure not to reduce it to a slurry. Transfer to a bowl, and fold in the chopped bacon, quatre-épices, brandy, cream, eggs, and thyme. Season with salt and pepper, and mix well. Wrap half a tablespoon of the mixture in a plastic film and poach in water for a few minutes. Let cool, taste, and adjust seasoning. Line a 10 x 5-inch loaf pan with thin bacon rashers. Spoon the mixture into the pan, covering top with the bacon overhang. Cover tightly with aluminum foil. Prepare a water bath: place the loaf pan in a larger, deep dish. Bring some water to a simmer and carefully pour it in the larger dish. The water should reach approximately halfway up the loaf pan. Put the water bath and the loaf pan in the oven, and bake for 2 hours. Uncover and bake for another 30 minutes. The terrine should be cooked through, and you should be able to slice into it with a knife and leave a mark, but it shouldn’t be too dry. Refrigerate, as this pâté needs to be served cold. Unmold onto a serving platter, cut into slices, and serve with bread. The second one I made is seafood. This is not one of the recipes given because I didn't have salmon. I had a half pound of scallops and found a seafood terrine recipe from Michael Ruhlman's CHARCUTERIE. The terrine has scallops, blue crab meat, saffron-infused cream, and chopped chives. The pinch of saffron lends its unique flavor and pale yellow color to this delicious terrine. I made sauce gribiche as Ruhlman suggests in the book and baked Spiraled Wheat Loaf from King Arthur Flour website. Great stuff. Freeze all the the blades and bowls before starting. Wash the leek greens thoroughly. Cook them for 8 minutes in a large pot of heavily salted water. Drain and chill in ice water, then drain and pat dry. Lay out on plastic wrap. In a small saucepan, bring the cream to a boil over high heat; remove from heat. Add saffron and let sit for 15 minutes to infuse the cream, then chill, uncovered, in the refrigerator. Combine scallops with the egg whites in a food processor and puree until smooth. While the machine is running, add the saffron cream in a slow, steady stream. Season with the salt, pepper, and lemon juice. Transfer into a bowl and fold in the crab meat and chives. Cover with plastic wrap and refrigerate. Moisten a 1½ quart loaf pan with water and line with plastic wrap, leaving enough overhang on the long sides. Line the mold crosswise with the leeks leaving enough overhang to cover top. Pack the scallop mixture into the pan. Fold the leek greens over the top, followed by the plastic wrap. Cover with aluminum foil. 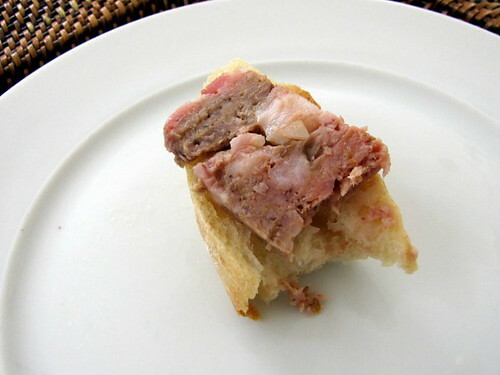 Place the terrine in a high-sided roasting pan and add enough hot water to the pan to come halfway up the side of the loaf pan. Bake until an instant-read thermometer reads 140°F. Remove from the oven, remove the terrine from the water bath and let cool. Refrigerate overnight. Cook the egg in boiling water for 10 minutes. Remove from heat, drain away the water, and cool the egg by adding ice and cold water to the pot. Once cool, peel the egg then extract the yolk. In a medium-sized bowl, mash the yolk until smooth with the mustard. Dribble in the olive oil, beating with a fork or wooden spoon while doing so, then adding the vinegar. Chop the egg white and cornichon separately into fine cubes, the size of the capers, and add them to the sauce. Then add the capers themselves. Stir in the herbs and add salt and pepper. Taste, and season with additional salt, pepper, and vinegar, if necessary. Serve at room temperature. And I couldn't resist having sweet fruity terrines. I made a mini Caramel Pear Terrine with Kumquat Star Anise Rum, the recipe adapted from here and Sidra Berries Terrine. Both are delicious. In a small bowl, soften the gelatin in ¼ cup juice. Heat the remaining juice to boiling. Remove from heat and stir in the gelatin mixture and sugar. Transfer into a bowl and add the sidra. Stir gently and mix well. Arrange a layer of berries on the bottom of an 8 x 4-inch loaf pan. Cover the fruits with the gelatin liquid, let set in the freezer for 5 minutes. 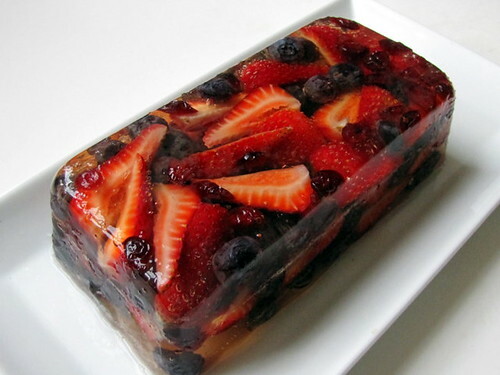 Continue layering fruits and liquid, letting set in the freezer until the loaf pan is filled to the top. Cover with plastic film and let set completely in the refrigerator for 2 hours. Unmold onto a serving plate and cut into thick slices. Enjoy. Oh wow! You really went all out with this challenge. Love everything that's being showcased especially the sweet pate. Those berries look so ripe and sweet. O I love your dessert terrines! They look and sound very tasty. Nice job on the challenge. I chose the same bread, one of my favorites. Your fruit terrine looks stunning. Love all your pates, but I think the berries terrine is really beautiful! Great job! Oh my gosh!! I have to have those fruity ones! Great job on this challenge. Everything looks amazing! You really knocked this challenge out of the park! I mean, wow! I have to try that seafood terrine sometime... And that bread is so beautiful! Also love the fruit terrine. Thank you for cooking with us! My goodness, everything looks so beautiful! 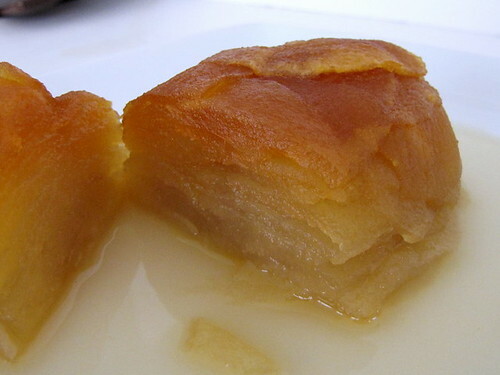 The caramel pear terrine is causing me to now drool all over the keyboard. Mmmmmm-mmm! Great job! Your pate's look beautiful, especially the fruit one! I bet they all tasted great. And it looks as though your bread turned out perfectly! Wow... that berry terrine looks like a work of art! I is almost a shame to cut into it... almost...! Great job on this challenge! Amazing - love the dessert terrines!! 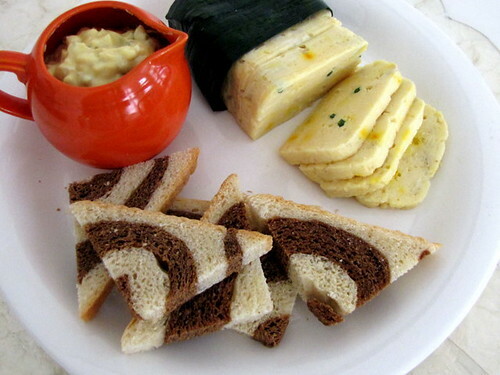 WOWOWOWOW that seafood pâté looks like dessert and that striped bread is amazing and so so elegant looking. I have to admit your photographs are good enough for a cookbook. Just thinking of your seafood pâté makes my mouthwater. Fabulous work on this challenge. The fruit pâté is astounding. Your pates look so delicious, but that spiraled wheat loaf has got to be my favorite. Good job! Your version of the seafood terrine sounds like it would be fabulous, too! Great job--your pates look gorgeous, and so does that spiral bread! I'd like to try the seafood one. You really ran with this one. WOW on everything, live the pinwheel bread and sweet patés! Thanks for participating in our challenge. Excellent work on all your variations. They are beautiful and sound delicious. I started reading the ingredients on the crab and scallop terrine and it really pulled me in. Will be trying that one soon. Thanks everyone specially to Valerie and Evelyne.